Take all the synths you can carry – even your virtual instruments – to the stage! Really! And operate them from your favorite keyboard controller(s) as if they were just one synth. Create massive layers, velocity layers and splits from different synths as if they were one! Use any controller/keyboard on any synth. You don't even have to remember what patches to call up or even what keyboard to play on. 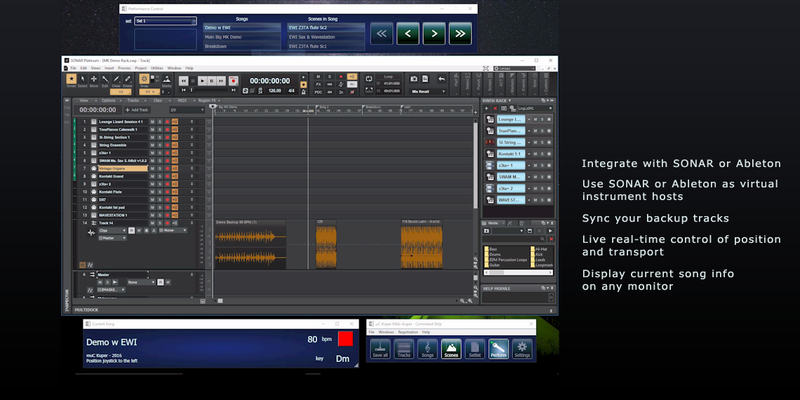 If you've recorded an original and need to use backing tracks, Midi~Kuper integrates with your DAW transport too and sends position pointers and play/stop commands. Free 45-day trial. And now, a freeware Light Edition with no time limit. 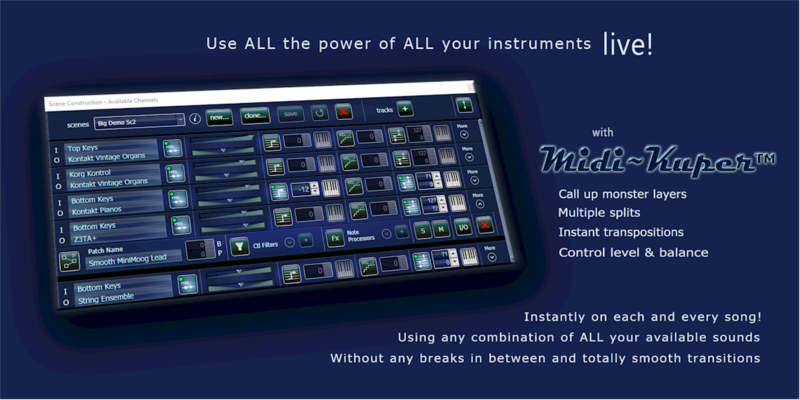 Midi~Kuper is a tool for the live performing keyboardist or electronic musician that will forever change the way you perform live. No more waiting between songs to call up a couple of patches or to switch to a different pair of keys. Just hit the Next button and the sounds you programmed for the next song smoothly reconfigure themselves on your controllers. 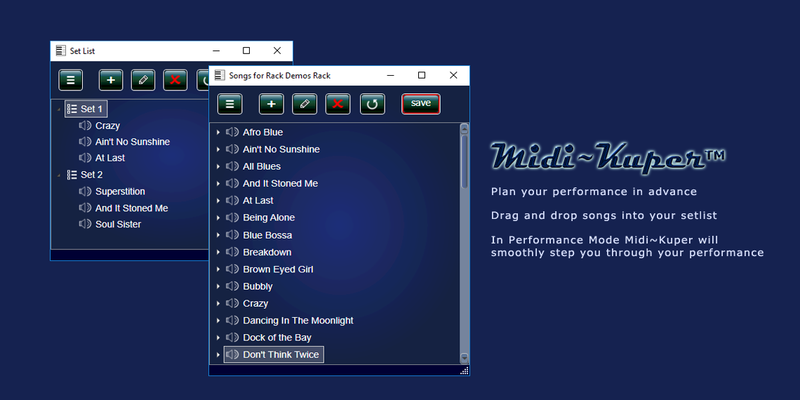 Midi~Kuper is a giant, virtual, practically unlimited MIDI patch matrix that programmatically reconfigures itself instantly based on the song you are performing. Midi~Kuper allows you to patch MIDI signals from any device, keyboard, controller, control surface, etc., to any available MIDI instrument, synth or destination device of your choice. You don't need to limit yourself to synths. You can for example send the same MIDI messages from one of your keyboard controllers to a synth patch while simultaneously routing the same signal to a voice harmony box. 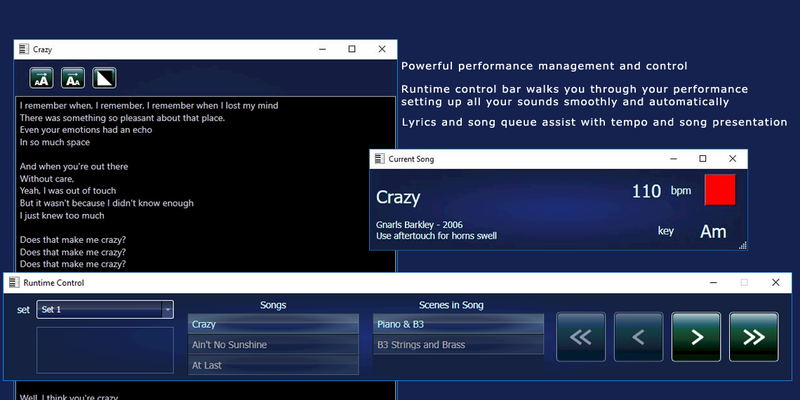 And by the way, if you need to also change the program on that harmony box to suit the song you are performing, Midi~Kuper will do that for you automatically as well. How will it help my performance? Midi~Kuper will let you avail yourself of every sound in your collection of synths and sounds instantly, automatically, smoothly, with no waiting or audible transitions, so you can step through your planned live performance with no interruptions or breaks, using as few controllers and keyboards as you wish, without limiting yourself to a handful of sounds. Give yourself the luxury of using customized combinations of all your sounds in a live performance, each combination tied to one or more songs, so you can keep it fresh on every song of every set. Integrate Midi~Kuper with your favorite DAW as a virtual instrument host so you can access thousands more sounds on your computer. Then synchronize your performance with your backing tracks and click track on the same DAW to sound like a giant production, all automatically controlled through Midi~Kuper at the touch of a single button. Instantly and on the fly, call up monster layers and splits using any sound from your arsenal, even mixing sounds from different synths and virtual instruments. Reassign the functions of any small or large control surface during your performance to fit any need as you perform. For example, you can use your sliders to control a tone-wheel organ's drawbars on one song, and as a channel volume mixer on the next, and a synth parameter controller on the following song. Mangle and transform your MIDI control messages, control instrument balance and pan from song to song, and more. Your imagination is the limit. And you can position these windows on large projection screens or monitors in strategic places so your entire band can benefit. No more yelling accross the stage: "What song are we doing next?" or "What key was that in?". 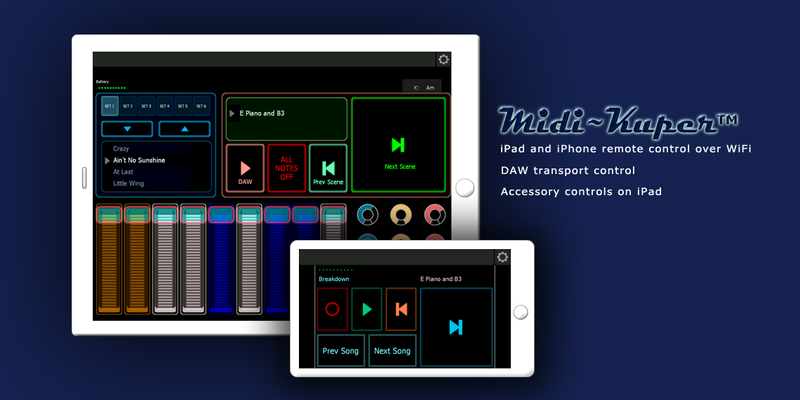 Control your performance wirelessly through your iPad, iPhone or other device supporting Lemur. See the current status of your performance on your device and quickly step to the next set of sounds with one touch.